The Way Of The Peaceful Warrior is one of the greatest motivational books that i have come across in my last 40 years on this planet. I believe it is a book that every person should read at least once in their lives. It is a story that is part truth and part fiction that takes through the journey of a young man and his quest to become an enlightened individual... a peaceful warrior. "The Way Of The Peaceful Warrior is so appealing," commented Virginia Satir, "because it provides an easy access for people to naturally identify, connect and be in touch with the spiritual part of themselves." 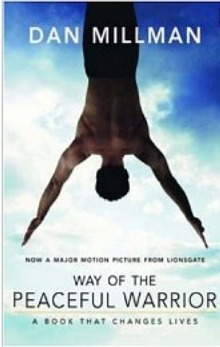 Indeed, The Way of the Peaceful Warrior does just that with its piercing truths, lively narrative and humorous wisdom. Like Castaneda, it enables the reader to reflect on the deepest questions of life. Yet unlike Don Juan, it spotlights the path to a happy, uncomplicated life without dependency on drugs. Told with drama and insight, the novel revolves around Dan, a world champion gymnast and student at the University of California at Berkeley. The story begins when Dan meets his powerful 96-year-old mentor Socrates, an all-night gas station attendant. Guided by this wise old mentor and tempted by an elusive and playful woman named Joy, Dan journeys through everyday reality and metaphysical realms. He travels the paths of flesh and spirit, romance and terror, light and darkness, laughter and magic, learning new ways to see the world and live life fully. Thematically, The Way Of The Peaceful Warrior is a tale of the eternal human quest for the meaning of life is the path of transformation and enlightenment. It uncovers concepts known deep inside but really allowed to wake up and be content with this knowledge. There is no need to search, so just be happy now! Love is the only reality of the world, because it is all One - and the only laws are paradox, humor and change.